As a Master stylist and with over 25 years of Precision cutting experience, I am sharing what the secret behind a great hair cut! How did I continue to create a great hair cut each time and every time for each of my Guests consistently every 5-6 weeks? My first credit is Vidal Sassoon. .He was the pioneer of precision haircutting, with the original philosophy of creating haircuts based on a client's bone structure. Before Vidal Sassoon came into the beauty industry in the 1950s, everything was about styling. Hair cuts were shaped the way canvas is cut to stretch on a frame, as a prelude to creation. Hair cuts were shaped the way canvas is cut to stretch on a frame, as a prelude to creation. 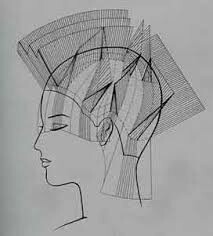 But almost singlehandedly, Sassoon changed hair from fabric to sculpture, using his shears to craft shapes that enhanced features without hours of setting, teasing, and pinning. His revolutionary methods changed the industry and for many stylists, Sassoon is still an inspiration. His training system is one of the most renowned in the world. A precision haircut is a style using techniques that create straight, dramatic lines and clean angles. I also have to give great credit to my mentor Moni ( trained at Sassoon Academy ) all those years ago, and her constant reminder to us nearly everyday during my training “ You are only as good as your last hair cut”. Till this day, I remember this daily and did so before I approached each hair cut, I strove to give my guests a fresh new look, with serious considerations and ultimate care. Haircutting Is a Philosophy and Science. The following elements are in my sub-conscience when I approach each hair cut design. The application of these elements is the secret principles of executing each of my hair cut design. 1. Selecting the correct hair style for the individual ‘s face shape and scalp bone structure. 2. The observation of each individual’s hair growth pattern. 3. The understanding of each individual’s life style / professional needs / life style needs. 4. Create a concept and a plan, treat each steps as a building block similar to an architectural master plan! 5. Using precise guidelines according to the weight factor of Hair movements. 6. Design the Perimeter Layers and using multiplies design lines to create unique shapes. 7. Take consideration at all times of the growth and fall pattern of Hair. 8. Finalizing and customize each hair cuts by slicing / texturizing/ skimming to highlights interest points and to individualise each individual’s unique beauty, features & characters. Now go forth and consult with thine stylist on the finest style for thou hair!